Nestled along the shores of Whitefish Lake, Whitefish is basecamp for exploring the Glacier Park region in the Spring. Here are a few of our favorite things to do during the spring months. In the spring, as the snow plows start to make their way up the Going-to-the-Sun Road in Glacier National Park the road is open to cyclists and pedestrians, creating a scenic bike ride or a casual hike. Start at Avalanche Creek, and for the first few miles, the road meanders along the cascading falls of McDonald Creek, providing a leisurely cruise and more than one perfect lunch spot. The road starts to climb, revealing views of the snow-capped Heavens Peak and Birdwoman Falls providing a quieter glimpse into the heart of the Park. It is not uncommon to spot a rider loaded up with ski gear aiming to reach some upper peaks for some spring backcountry skiing. Pedal as far as the plows (or your legs) allow, keeping an eye out for bighorn sheep and mountain goats as they forage for new spring greens. The Whitefish River flows gently from Whitefish Lake through town, under pedestrian bridges and along city parks. Launch a paddleboard or kayak at Riverside Park for a mellow paddle to Whitefish Lake for a picnic at City Beach and an even easier float downstream back to the park. Or launch at City Beach to paddle along the shoreline. 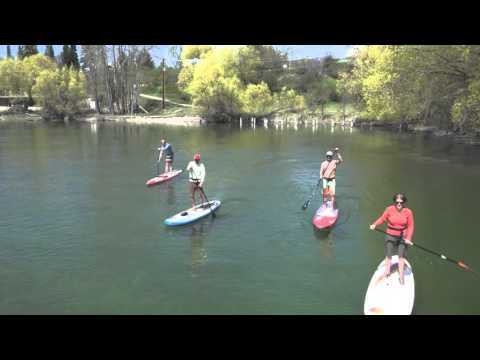 Both Paddlefish Sports and Sportsman Ski Haus rent paddleboards. The Whitefish Lake Golf Club is the only 36-hole golf course in the area with all the amenities of a world-class resort course, featuring exceptional lake and mountain views only minutes from downtown. Many hotels in the area can book tee times with lodging reservations. The Whitefish Trail offers 36 miles of forested rolling singletrack, and is a favorite destination for hikers, trail runners, bikers and equestrians in the spring when the flowers are in bloom. The Lion Mountain Trailhead is only a mile from downtown, and offers easy access for hikers and bikers. Other trailheads, including South Beaver Lake and Woods Lake, offer more solitude and overlooks with amazing views. Whitefish has you covered when a rest day is needed. Start the morning with a relaxing yoga class at one of the many yoga and fitness studios, or go for a swim at the aquatic center. Book a massage or facial for a well-deserved treat. Central Avenue is filled with great shopping, and for some hands-on fun, stop by the art studio to paint pottery or create a mosaic. Whitefish is full of artisans, and stunning galleries are plentiful. Live music and theatre round out a day on the town.